Seven year old Olivia and her Father Steven have packed up and moved to the country. Steven is an author looking for a quiet place to write. Olivia and her dog Tula are looking for fun and adventure in their new home. Late one night Olivia has a snack of cookies and milk. When Olivia forgets to put the milk away she returns to the kitchen only find a large furry monster eating the rest of Olivia’s cookies. After learning that a monster in the house is good luck Olivia is set on befriending the monster that resides in their hidden attic. She had no idea how difficult that would be. This story is very heart warming. A perfect read for children as the story touches on so many topics. With lessons involving friendship, prejudices, fear, learning to trust and bullying the Author has an amazing way of relaying his message in fewer than 100 pages that will touch the heart of any young reader. I really enjoyed this book as it is a very cute story with adorable illustrations randomly scattered throughout the book. I highly recommend this book for young readers. Though the main character is a young girl, the book contains a grumpy monster so both boys and girls will love this book. 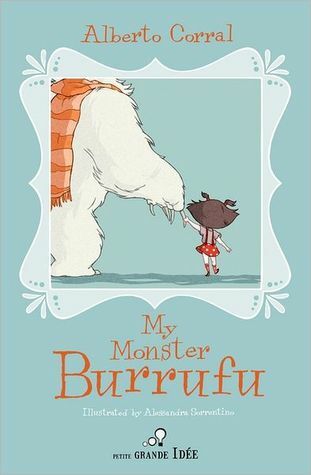 What an amazing story and I am so happy to have had the chance to read and fall in love with Olivia and her monster Burrufu! Hi! Stopping by and now following you from Tots & Me Hop. Blessings! I Just Hopped Over From The Weekend Gathering Blog Hop, And I’m Following You via GFC. OMG i LOVE your blog!! Im always loking for good books to read!! Iv snagged a few of your Review page!! Thanks!! Ahh, fun book and just a cute cover. I enjoyed reading it. Your blog hop friend. Thanks for posting. Seems like it’d be an interesting read to my daughter. I’ll have to check this one out. Just found you from Feed Me Friday… what an awesome blog! I’m looking forward to finding more books for myself and the kids! Sounds like a fun book! Hope you have a Happy New Year, Miranda!! Oh this sounds like a great book! PS just signed up to be reminded of hops!! Oh, this is great! My daughter is really in to monsters right now. She would love this. What timing!